The article says “In addition, 73 children sentenced to life without parole were 13 or 14 years old at the time of their offense.” That certainly is an age of delinquency/trouble. 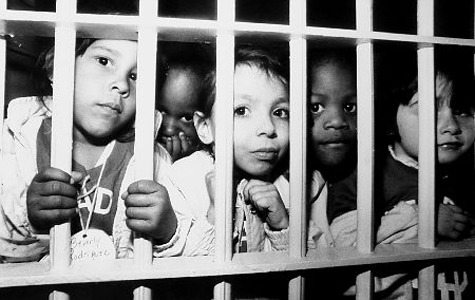 The article here uses a photograph of much younger kids behind bars than the photo I see at http://atlantablackstar.com/2015/03/10/un-special-report-u-s-is-only-country-in-the-world-to-lock-up-children-for-life-an-inhumane-practice-that-disproportionately-devastates-black-children/. So I am super curious as to how many kids under the age of 10, let’s say, are lifers. It would be neat for you to do some more investigative reporting on this. I’d certainly read that. It would be especially neat if you could interview a couple of insiders. Sorry if this is too long. Thanks for posting the article. The pic came from a different source, unfortunately my wordpress account only lets me post links from different sources and not the full article, like you can do on Facebook or Google+. If you want to read more on the injustices of the justice system, you should read the book the New Jim Crow by former civil rights lawyer and college professor Michelle Alexander. She gives a lot of details, more than I ever could in a short reply. Ah, thank you. Her book is a little out of my price range right now but I put it on my wish list. I read through the comments on Amazon. The issue is important enough for another investigative reporter to write about it. Readers accuse her of bias and someone else can use that as a legitimate excuse to write about it also. The Nancy Drew part of me would really like a go at this. I hope someone closer to the situations in those states takes picks up the quest and keeps these issues exposed. I hope y’all keep me updated. Thanks again, Leon.